I first heard of Innov8 athlete supplements from this guy I went on a date with the other night who said he is ‘buddies’ with Mike O’Hearn. If you don’t know who Mike O’Hearn is, you probably should crawl out from beneath that rock you’ve been living under. Lol. But no really. Big Mike O’Hearn, also known as ‘Titan’ from the original American Gladiator, is still kicking around the fitness industry, and seems to have mixed himself up into this new Innov8 Athlete supplement company. It’s hard to tell how deep he is mixed, though. And that’s why I said in my intro- I’m really not sure how many of you are going to read this Elev8 pre workout review. There are QUITE a few pre workouts out there. After browsing Mike’s ‘Insta for a bit, it doesn’t seem like he’s REALLY sold on these supplements. I actually predict Innov8 is out of business within months. But. Let me tell you about Elev8 pre workout. My ‘friend’ got me a tub by the very next day. I bet they have plenty of stock. Lol. Ugh. I’m such a b-i-t-c-h. Whatever. He didn’t even pay for me. Let me tell you about Innov8 from a flavor standpoint first. What is the Best Flavor of Innov8 Elev8 Pre Workout? But first can we talk about how boring this whole ‘using numbers in the product / company name’ thing is? Like. Stop. I don’t want to type the number 8 into my Innov8 review a million times. And I’m sure your customers don’t feel like toggling over to the numbers on their iphone keyboards to find your lame IG page. And it IS lame. Geez. Salty Allie. Relax. Lol. I’ll try. Sigh. Let’s talk flavor. What does Elev8 taste like? It tastes like 95% of these pre workout supplements tastes like. Sour candy mix. I tried the Blue Raspberry or ‘Blue Razz’ flavor of Elev8, and thought it was very average. It was very blue. Very sweet. Very sour. I suppose it tasted just fine. I didn’t think it was great, but at the same time I would drink it again. I’ll give it a 7.5/10. Oh. As for what’s the best flavor of Elev8 pre training complex, I have no idea. I only tried the Blue Razz. I’m sure the fruit punch tastes pretty much the exact same though. Ok let’s talk formulation. 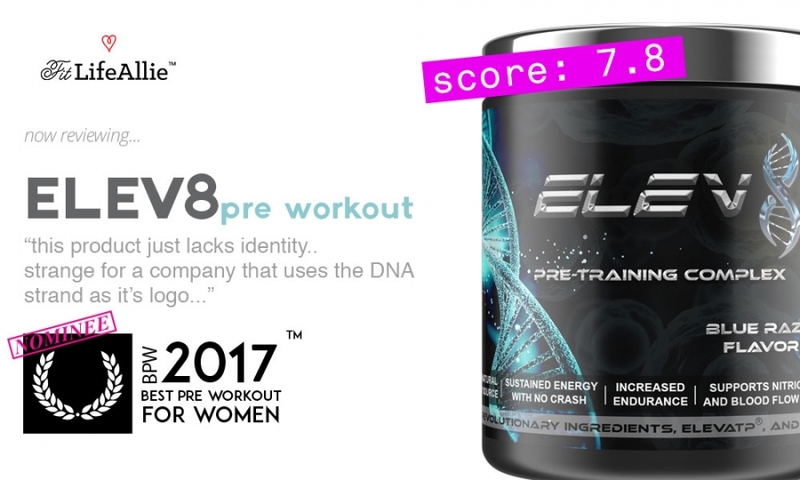 What are the Ingredients in Elev8 Pre Workout? The ingredients in Innov8’s Elev8 pre workout are the same ones that you’ve seen a million times. I see plenty of B-vitamins. Plenty of Taurine. Lots of Pump ingredients. Actually not too many stimulants. Hm. Let’s list these ingredients all out. Might as well. You know what? Looking over this formla again- it’s really not so bad. It’s a non-proprietary blend that has a great dosage of some of my favorite ingredients. I’m a big fan of the PurCaf organic caffeine ingredient. I always have been. I’m also a big fan of the pump complex. I can tell Mike O’Hearn must appreciate a little ‘oomph’ from the pump side of things. As far as strength ingredients, I don’t say any of the big three, which, in my book are L-Betaine, a form of creatine, and a form of BCAA. Now. That’s not terribly surprising, but just don’t expect to set any PR’s on Elev8 pre workout, especially given the lack of a heavy stimulant. But to summarize the formula section- Elev8 a non-proprietary, thoughtful formulation, if a touch under-dosed in some areas (caffeine, beta-alanine, etc) I kinda like it. 8.5/10 on formula. Let’s talk packaging now. Elev8 Pre Workout Looks Aren’t Impressive. I know. We’ll get to the performance section soon, I promise. But we simply MUST talk about the packaging at some point. This won’t take long. Because just like almost every pre workout I try, I’m simply not that impressed with the aesthetic. Innov8 went that very 1990’s direction of using the good ‘ole double helix/DNA strand-thing to try and say ‘hey look how legit we are’. It doesn’t work. Everyone can tell Innov8 is probably run by two of O’hearn’s buddies who were like ‘hey Mike we have this sweet idea and we’ll cut you in on it, and you’ll just promote the products on IG- sound good? Man?” LOl. But I digress. Innov8 pre workout, unlike it's spokesperson, is not a good-looking product though. I don’t think you’ll argue. The Elev8 font for the title is way too overdone with the fake metal texture. The big cinematic DNA strand also just rubs me the wrong way. It doesn’t look legitimate but rather foolish and trying to hard. The choice of fonts overall are so poor. And the layout is also weak. Overall bad design from Innov8 athlete. All can be forgiven if the product works though- you guys know this. So. Does it? Does Innov8 Elev8 pre workout actually work? Does Elev8 Pre Workout Work? I’ll say this. It doesn’t NOT work. Haha. There. That helps you right? Can I extrapolate on that. Of course. Here’s what you need to know across all key criteria for a pre workout. Endurance: I was not blown away by Elev8 from an endurance standpoint. Initial energy is okay, but it can’t carry you for over 45 minutes or so. I attribute that to a rather entry-level energy complex though. Energy: At no point was I ever like, jumping out of my chair in eagerness to workout after drinking Elev8. It does provide a very light stimulating effect, but honestly you’ll get more from a cup of Starbucks than you will from Elev8 pre training complex as far as energy goes. When I do my coffee pre workout days, I can hardly sit still after about 20 minutes with my venti with doubleshot on the side. I know. That’s a crapload of caffeine. But I’m a big animal to take down. Lol. Not like. Physically big. But. You know. I just have a high tolerance for caffeine after years and years of usage. And by usage I mean abuse. Lol. Pump: Easily the most prominent feature of this product is the pump. I think my forearms looked almost masculine during my lat workout. I was doing chinups paired with tricep extensions, and seriously I had that roadmap look that you see in the bodybuilding magazines. I was getting looks. Like. Who is this crazy man-woman. Lol. No I wasn’t really. But I did have some serious vascularity. Overall, the performance of Innov8 pre workout is pretty good. It’s not spectacular, but it’s just enough energy, just enough endurance, and a fun pump component. So where does that leave us?